I was this close (pinching fingers together) to becoming a baker. But the 2 a.m. start times quickly swayed me into a culinary tract in school. 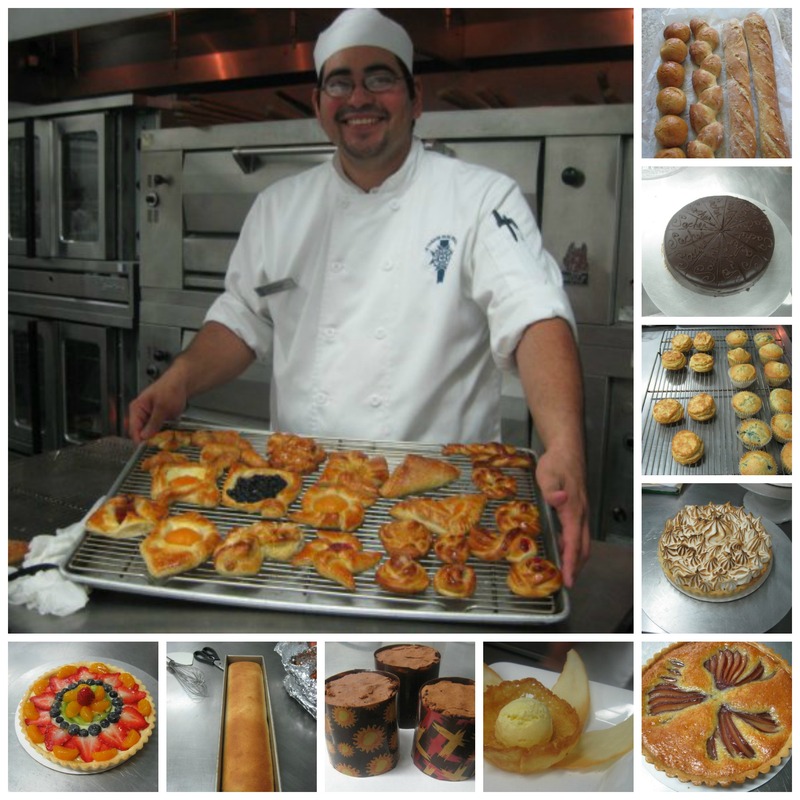 Still, those two baking courses at Le Cordon Bleu aroused within me a yearning to bake. The soft, fluffy sifted flour. The rich creamed butter. The yeasty smell of warm, fresh bread. Loaves. Cakes. Pies. Tarts. Croissants. Cookies. Muffins. Biscuits. Baking can yield all this and so much more, and while I profess my love for sugary pastries, I always end up loving bread the most. And then came this recipe for an Italian Easter bread, a lightly sweet bread featuring a cooked egg nestled on top. Two years ago I came across this Easter bread that was fun, festive, sweet, and so darn delicious. 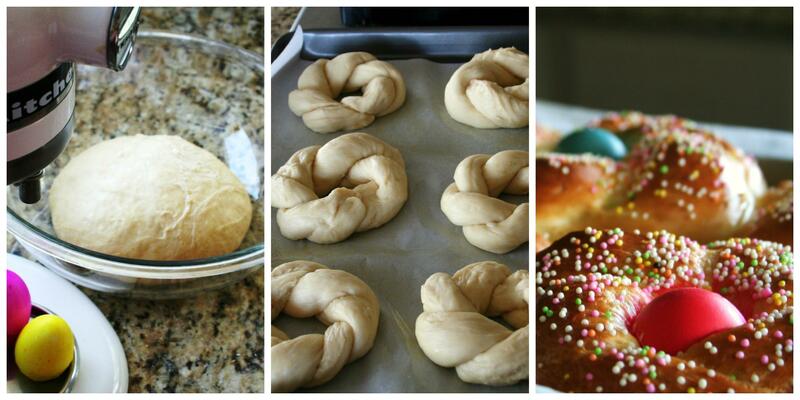 Since Homeric times, Easter bread has been baked across Europe, and now in my kitchen. 1. In a stand mixer, combine the yeast, milk, salt, butter, 2 eggs, and sugar. Using the dough hook, with the mixer on low, slowly mix in half the flower. Continue mixing in the flour just until the dough comes together and is firm and no longer sticky. The amount of heat and moisture in your kitchen will dictate how much flour you will actually use. Mix the dough until smooth. 2. Turn out the dough into a large greased mixing bowl. Cover with a clean kitchen towel and allow to rise in a warm place for an hour. The dough will have doubled in size. 3. Punch the dough down and then divide into 12 equally sized pieces. 4. Working with 2 pieces at a time, roll each piece to about 14 inches long and about 1 inch thick. Take the two long pieces of dough and twist together into a “braid.” Pinch the ends and loop into a circle. Place 3 dough braids on 2 parchment-lined baking sheets. Cover with clean kitchen towels and allow to rise in a warm spot for about an hour, until the dough doubles in size. 5. Preheat your oven to 350°F. In a small bowl, beat the remaining egg with the teaspoon of water, lightly brush the egg wash onto the dough braids. 6. Gently press 1 dyed Easter egg into the center of each dough braid. Bake until golden brown, about 20-25 minutes. Cool on a wire rack. Will you bring me 1 for Easter Sunday?